The name ferret comes from the Latin furittus meaning "little thief." They thought that ferrets were first domesticated 2500 years ago for hunting rabbits. Ferrets were most likely domesticated from the Western European polecat or possibly from the Eastern European or Steppe polecat or since these two species of polecats can interbreed maybe the domesticated ferret is the result of an interbreeding the two. It is speculated, based on literary references, that the Greeks or Romans were the first to use ferrets for hunting but no positive evidence has been found. A ferret liked creature was written about by Greek authors Aristophanes in 450 BC and Aristotle in 350 BC. Later Strabo writes about a Libyan animal being bred in the Mediterranean Balearic Islands to help control rabbits which were eating the domestic crops. The Roman soldiers also apparently used ferrets to hunt rabbits. It is likely the Roman soldiers first brought the ferret to northern Europe during the growth of the Roman Empire although some believe these animals first arrived in Europe with the Norman invaders. The ferret has a long skinny body; about 20 inches long including a 5 inch long tail and weighs only 1.5-4 pounds. Their shape combined with their inquisitive nature makes them well suited for getting down rabbit holes and chasing rabbits and rodents out of their burrows. Ferreting, as the practice of hunting with ferrets is called, began when farmers used these cunning animals to flush rabbits out of their holes so that the farmers and their dogs could kill the rabbits more easily. Later ferreting became a popular sport hunting activity in Europe. Historical references from the 1200's report ferrets being used to hunt rabbits in Germany, England and by Genghis Khan in Afghanistan. Later, they were introduced to control the rabbit population in New Zealand and Australia and in North America where they were used primarily to control pests at grain storage facilities and on board ships to control rats. In many countries the original use of ferrets to hunt rabbits is outlawed today because of the fear ferrets could unbalance the ecology if introduced into environments where they have no natural predators. This is certainly the case in New Zealand where the ferrets imported in the 1800's to control the rabbits found no natural enemies and a friendly climate. The ferret population in New Zealand has grown from the original few hundred imported animals to over one-million today and has become quite a problem threatening to wipe-out some of the native flightless New Zealand bird species. 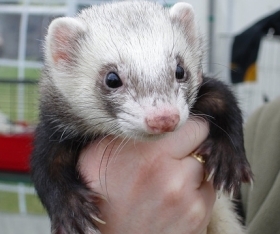 Today the ferret is still used in Britain, Europe and Australia to hunt rabbits and although it is illegal to use them to hunt rabbits in the United States ferrets are used to hunt rats in the United States and elsewhere. The ferret has been trained to run communication wires and cable and guide strings for fiber optic technology for telephone and computer technology companies. Most commonly today however the ferret is kept as a pet and human companion. All about ferrets as pets. Facts about ferrets as pets.